. :: Tabernacle Pentecostal Church Kristus Kasih - Malang - Information tabernacle equipment: table of showbread ::. It had a crown of gold round about and also a golden frame, a handbreadth wide with a crown. The four rings of gold were fastened to the four corners, close to the frame, to hold the staves/poles in carrying the table. The two staves/poles were made of shittim/acasia overlaid with gold. The plates and dishes (for incense), the flagons and bowls were also made of pure gold. The twelve loaves of bread were set in two rows, six in a row, upon the table of pure gold (pure means holy). 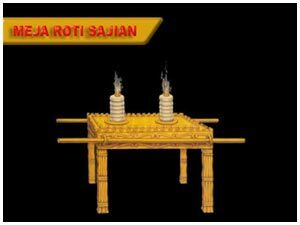 Pure incense was put upon each row to go with the bread as a memorial, an offering made by fire unto the Lord. Every Sabbath this bread was to be set in order before the Lord continually (regularly); this means the old had to be replaced by the new. The bread replaced was the priests’ provision, a most holy portion out of the offerings by fire to the Lord by a perpetual statute. The Table of Showbread signifies an intense fellowship with Jesus, the Son of God, through the word and the Holy Communion. TABLE (TABLET) = human hearts (Proverbs 3:3; 7:1-3; 2 Corinthians 3:3). The heart, ours and that of the Church, must be pure and holy (Leviticus 24:6) before the Lord. The purer the heart is the more shall the word of God – the BREAD of LIFE – be revealed. On the other hand, the more the Word of God is revealed the purer the heart is. The table overlaid with Gold denotes holiness and purity wrought by the Holy Spirit through the Word of God.